President Donald Trump has signed memorandums and executive orders this past week that continue to cause a commotion in the media. This week, three executive orders and three memorandums were signed. 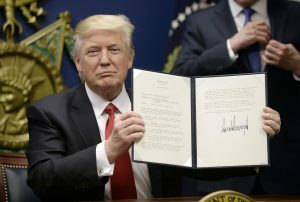 This executive order allows for the government to protect the American people from terrorist attacks by investigating individuals before they are granted a visa to enter the country, including those who don not abide by the constitution. This includes those who partake in violence towards women, hate crimes, and religious persecution. “It is the policy of the United States to protect its citizens from foreign nationals who intend to commit terrorist attacks in the United States,” as stated in section two of the order. This allows agencies the allotted time and resources for proper reviews to be held by the appropriate agencies, such as United States Refugee Admissions Program (USRAP) to continue their process. Once reviews are completed within the 120 days allotted, the Secretary of State, Secretary of Homeland Security, and Director of National Intelligence will decide and determine which countries and nationals are safe to enter the country. USRAP can continue immigration procedures into the United States once again. This order mandates that every appointee of an executive agency that has taken office on or after Jan. 20, 2017 contractually must follow a pledge. The Pledge contains six sections that all executive agencies must follow. Section one contains the pledge that they must agree to follow. Section two defines the jobs, responsibilities associated with each respective position. Section three allows the president to waive the pledge if deemed necessary. Section four enforces that directors of agencies must create rules and procedures for employees to follow. Section five allows for any means necessary to be taken in order to enforce these procedures legally. Section six, the final section allows for this order to supersede previous orders but does not get rid of them. The order allows for agencies to be financially responsible for public and private sources, allowing a more successful budgeting process. The Director of Office Management and Budget will provide guidance to agencies on the executive order, such as managing cost, regulating expenditures, determining cost of existing regulations and so on. The Director must also present agencies with their annual incremental cost. This regulation will not impede “regulations issued with respect to a military, national security, or foreign affairs function of the United States; regulations related to agency organization, management, or personnel; or any other category of regulations exempted by the Director,” according to information available on The White House webpage. Allows for the Armed Forces to rebuild, allowing for a more effective and prepared military force. Within 60 days of this memorandum being signed by the President, Secretary of Defense, and Directory of Office Management and Budget must bring forth a plan to be reviewed to strengthen the armed forces. Nuclear review shall also be brought forth by the Secretary of Defense to see its capability to deter 21st-century threats. New ballistic defense must be implemented as well by the Secretary of Defense. “The Secretary is hereby authorized and directed to publish this memorandum in the Federal Register,” said Trump. This allows for a plan to be brought up to defeat and eradicate ISIS. Within 30 days, this plan must be presented to the Secretary of Defense. This plan also empowers coalition forces and blocks all cyber communication to isolate ISIS. All outlets that support the flow of revenue to ISIS will be cut off from financial support. This memorandum affects major branches within the United States government, rearranging the order of power by adjusting the decision making done by the committees. The order being, Principals Committee, Deputies Committee, Policy Coordination Committee and General. Each committee having their own set of responsibilities.